Ahmedabad, India, 9th March, 2016: A recently released study by Mumbai-based TRA (formerly Trust Research Advisory) The Brand Trust Report, India Study has been released for 2016. The report features eight category leaders from Gujarat. AMUL (All India 41st Rank), the pride of Gujarat, has been listed as India’s Most Trusted Dairy-Diversified (F&B) brand. It also holds its pride by being the only reigning brand in the Butter Sub-Category, bringing home ‘The taste of India’. Fogg (All India 67th Rank) leads in the Deo/Perfume Category followed by Axe and Wildstone. Sintex (All-India 214th Rank) leads as India’s Most Trusted Brand in the Manufacturing-Diversified Category. While Astral Pipes (All India 870th Rank) is the Most Trusted Brand in Pipes Category. Ajanta (All India 282th Rank) is a forerunner in the Home Care Category and correspondingly is the leader in the Clocks Sub-Category. Yet another brand from the region, Symphony (All-India 579th Rank) has been ranked as the Most Trusted Brand in the Coolers Sub–Category of the Durable list. Gujarat’s love for food is reflected in the number of brands in the F&B Category. This has subsequently boosted the ratings of the Category and has made it the largest in Gujarat. Balaji (All India 124th Rank) is the Most Trusted brand in Packaged Snacks Category followed by Haldirams and Lays. Vadilal (All-India 277th Rank) ice cream is India’s Most Trusted ice cream brand and is followed by Havmor, Creambell among others. “Gujarat brands often surprise giving national leaders. Its giant brand Amul though still a category leader, has slid down 29 ranks in the All India rank. Also Fogg as a brand is seen to rise steadily for the past four years. The pro-active and walk-the-talk approach of the region truly represents the future of India and epitomizes development in its complete strength.” said N. Chandramouli, CEO, TRA. These revelations were a result of The Brand Trust Report, India Study – 2016, published by TRA (formerly Trust Research Advisory) a leading research organization dedicated to understanding and simplifying concepts related to Trust. Bangalore, India, 3rd March 2016: India’s most awaited and rigorous brand evaluation, The Brand Trust Report, India Study, a comparison of the trust held in brands, has been released for 2016. Samsung Mobiles leads South as the Most Trusted Brand as well as All-India rank, followed by Sony which secures 2nd rank sustaining its rank from All-India rank. Nokia ranks 3rd in South up one place from the All-India rank. LG is South India’s 4th Most Trusted brand, down one place and Tata secures South India’s 5th position, steady at the 5th in the All-India rank and Boost is the 6th Most Trusted Southern brand improving its rank by moving up 41 places from its All-India rank. Lava is at the 7th position, up 25 places and Dell at 8th position is maintaining its position from its All-India rank. Airtel is at 9th in the South up by four places and Honda is at 10th in the South India down by four ranks as compared to All-India ranking. Last year the five Most Trusted South India brands LG, Sony, Samsung Mobiles, Dell and HP. A comparison of the top 20 in each zone shows small differences. However, as we study the entire group of 100 brands these differences across zones become stark. 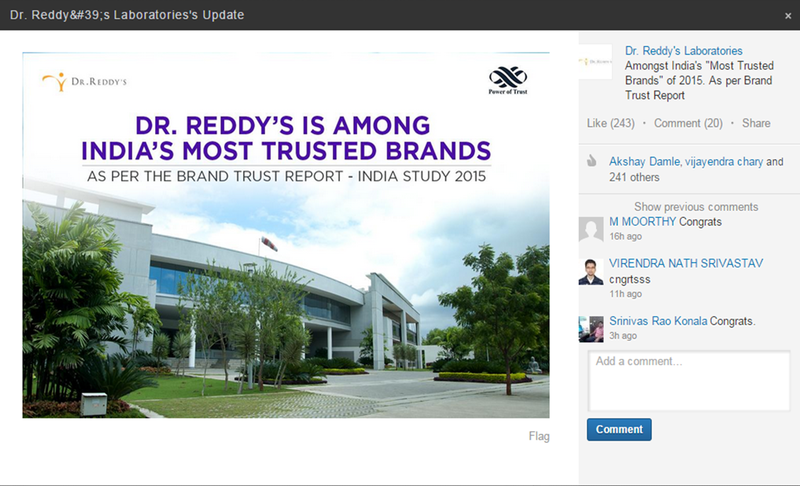 South India has shown its unique preference for 15 brands featured in South zone’s 100 Most Trusted Brands, which are not seen in the 100 Most Trusted of the other three zones. These include – All Out, Lipton, iBall, Dish TV, Good Knight, Oral B, Vim, Mirinda, Bournvita, Iodex, Facebook, Glucon D, Rexona, Olay and Wheel. The Brand Trust Report, the sixth in its series, is the result of a comprehensive primary research conducted on the proprietary 61-Attribute Trust Matrix of TRA. This year’s study involved 18000 hours of fieldwork covering 2500 consumer-influencers across 16 cities in India and generated 6 million datapoints and 20,000 unique brands from which the top 1000 brands have been listed in this year’s report. The 200 page, hardbound report is available for Rs. 14000/-. 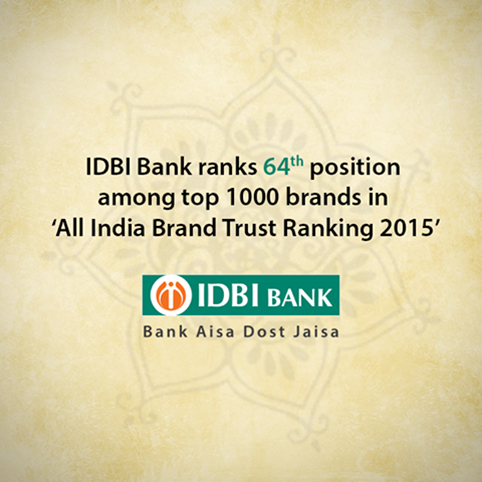 Among India’s 1000 Most Trusted brands, 267 categories were listed. The categories with the maximum brands were Food & Beverage represented by 152 brands, FMCG represented by 128 brands, Automobile represented by 72 brands and Personal Accessories represented by 52 brands. Mumbai. 12th March, 2015: For the fifth consecutive year, Google, the American multinational specializing in internet-related services and products has been declared the Most Trusted Internet Brand by The Brand Trust Report, India Study, 2015.Amazon, the online shopping portal, saw a new appearance in the 2015 trust rankings coming in at 146th rank overall and 2nd rank in the Internet category. 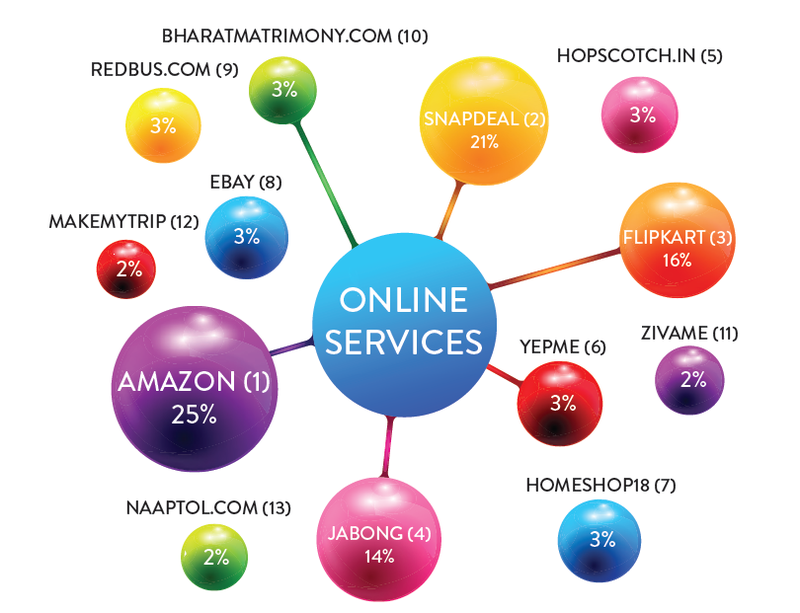 Snapdeal grabbed the third position in the Internet category jumping 917 ranks to 174thrank across India. The online shopping portals increasing popularity indicate a rising usage of online shopping as a definitive medium of shopping, given its convenience and cost advantages. Flipkart rose nearly 900 ranks to overall rank 212nd. This rising popularity however does not manifest in other internet related categories – a startling example being the social networking website Facebook, which sees a decline of 12 ranks in 2015. These revelations were a result of The Brand Trust Report, India Study – 2015, the fifth in its series, published by TRA (formerly known as Trust Research Advisory), a leading research organization dedicated to brand analytics. This year’s study involved 13000 hours of fieldwork covering 2373 consumer-influencers across 16 cities in India and generated 5 million datapoints and 19,000 unique brands from which the top 1000 brands have been listed in this year’s report. The 190 page, hardbound report is available for Rs. 14000/-. Notable mention is the 592 rank fall that is seen by Yahoo, a brand once the closest competition to Google. Wechat and Line, social networking apps too have not made an impact while the only surviving brand in the category WhatsApp falls by 200 ranks. Social media platform Twitter is a no-show in this year’s listings. It is interesting to note that of the 31 brands listed in Internet category in 2014 only 13 brands have been able to make it to the top 1000. Also an additional 7 new entrants in the category draw up the total number to 20 internet brands, moving away from the trend of the growth of Internet related brands each year. The Brand Trust Report, India Study, 2015 (ISBN: 978-81-920823-8-7), the fifth in the series, is the result of a primary research based on the proprietary 61-component Trust Matrix. This year’s research was conducted among 2373 consumer-influencers across 16 cities, and generated nearly 5 million datapoints and 19,000 brands, making it the most intensive study on Brand Trust across the globe. TRA, a Comniscient Group company, is an actionable insights and brand intelligence company dedicated to understanding and analyzing stakeholder behaviour through two globally acclaimed, proprietary matrices of Brand Trust and Brand Attractiveness. TRA was conceived in 2008 to decipher, analyze and measure Brand Trust, to make it universally understood and easily applied. TRA conducts primary research with consumers and other stakeholders to assist business decisions and give brands insights on solutions to consumer behaviour. TRA provides Competitive Intelligence Reports mined from its 11 million data-points on brand intangibles of 20,000 brands, and also undertakes custom-made studies for brands. TRA is the publisher of The Brand Trust Report, India’s Most Attractive Brands & India’s Most Trusted Educational Institutes. Its other group companies include Blue Lotus Communications, Blue Bytes News and i9 Communications. While most measure a brand in terms of market share, brand value, growth – the more important invisible and intangible components of brand behaviour are often lost to measurement. TRA (formerly Trust Research Advisory) with the help of the Brand Trust Report aim to look at these elements holistically and creates a singular metric in each case, that can measure the intangible and tangible attributes or traits of a brand in one unit. To feature in the report is a matter of great pride for any brand and to display this achievement TRA licenses its symbols so that the brands can carry the mark of their achievement with great pride. Licensing is an integral business development tool that provides brand with a competitive advantage. It helps the brand leverage its self in its marketing communication with a stamp of surety and confidence. The trust of an Indian consumer in a Korean product is a representative of the quality and prolonged positive brand experience. 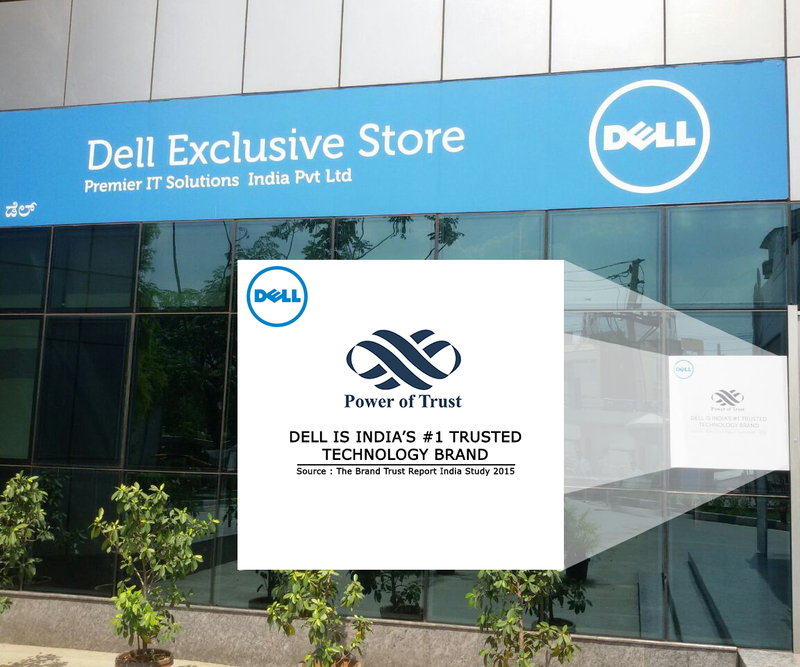 In addition to this Dell has made an active campaign to ensure that this great news reaches each and every one of their stakeholders by proudly displaying notices with in thier offices as well as retail outlets. When people’s car got the people’s trust, they went on to showcase this achievement across several online social platforms. 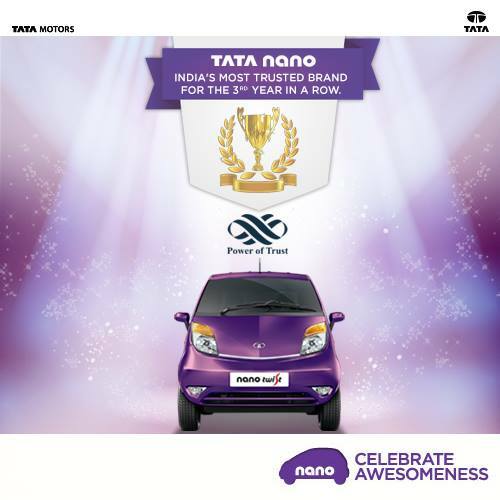 Cheers to Tata Nano! 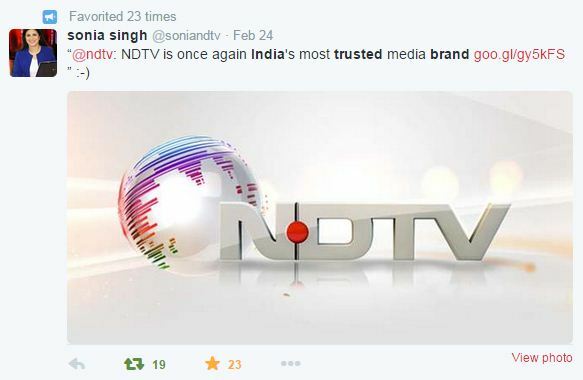 While brands chose to celebrate their awesomeness on social media, NDTV – the Most Trusted Media brand in India went on to display their trusted image through people who are representatives of the brand. In the quest of trust, certain brands are dependent on the trusted relationships that consumers share among themselves. For such brands, trust is imperative since they thrive in the market only if a desired result of a transaction is achieved with complete satisfaction and not just through high quality communication. 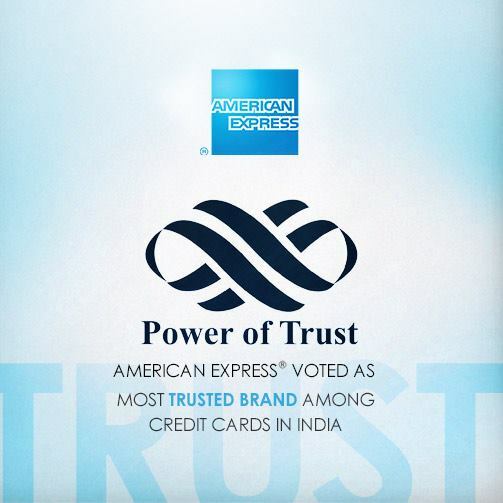 Top brands in India have always enjoyed people’s trust. Their legacy in the Indian market helps the brand inherit the trust of the parent brand. In case of Tata Nano, the parent went on to uplift their brand image through the people’s trust that was held by the child. This was a reverse case of inherited trust. What a moment of Joy!!! The expression of Trust is critical if you know that brand resides in the subconscious of your customer. As certain commodities in the market are dependent on trusted transactions, something like a credit card needs to tell its holders that their money is safe and in trusted hands. 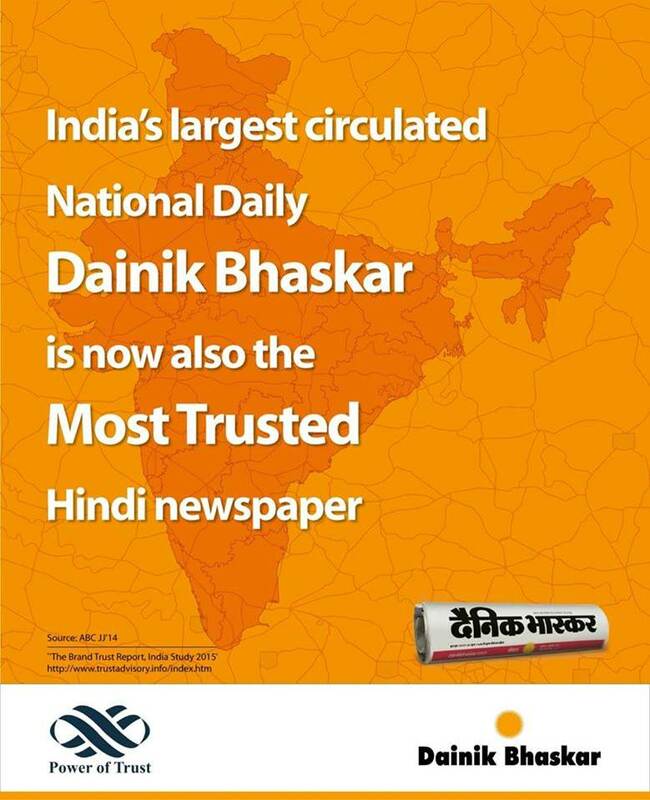 It doesn’t get better when the news is that the 2nd Most Trusted Brand in the industry is not a direct competitor but a worldwide giant and you hear it resonate with your Indian loyalists. So some competition is always healthy and a review from a third party industry critic amounts to loads of trust coming your way. This is your opportunity to resemble or rather position yourself as a brand as good as an internal giant who will someday be your direct competition. Interestingly Brand India Infoline has chosen to showcase the licensing symbol on their webpage in an innovative banner. Pune, India, 3rd March, 2015 : India’s much anticipated and most rigorous brand evaluation, The Brand Trust Report, India Study, a comparison of the trust held in brands, has been released for 2015. 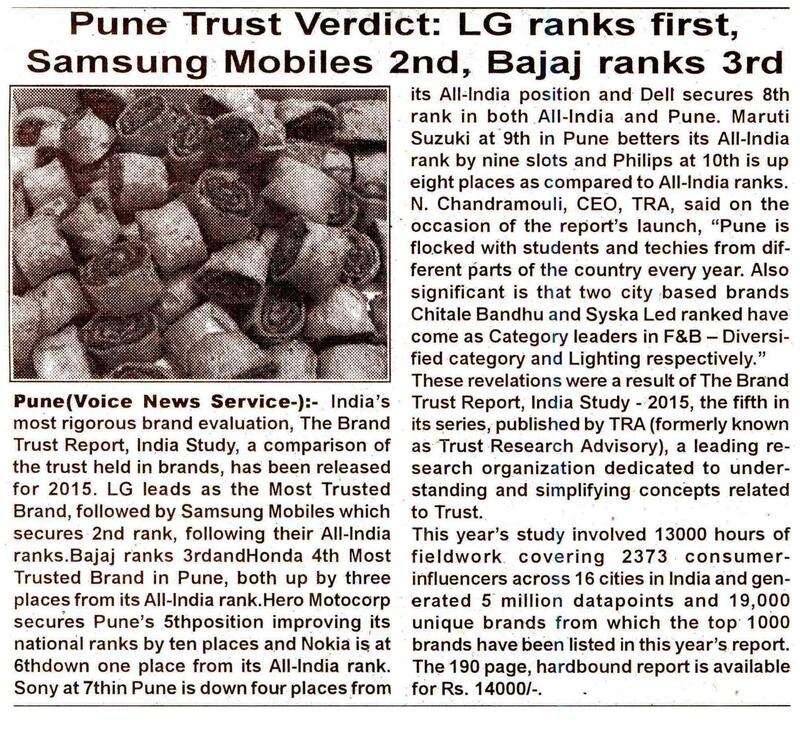 LG leads in Pune as the Most Trusted Brand, followed by Samsung Mobiles which secures 2nd rank in both All-India and Pune as well. Bajaj ranks 3rd and Honda 4th Most Trusted Brand in Pune, both up by three places from its All-India rank. Hero Motocorp secures Pune’s 5th position improving its national ranks by ten places and Nokia is at 6th down one place from its All-India rank. Sony at 7th in Pune is down four places from its All-India position and Dell secures 8th rank in both All-India and Pune. Maruti Suzuki at 9th in Pune betters its All-India rank by nine slots and Philips at 10th is up eight places as compared to All-India ranks. Chandramouli, CEO, TRA, said on the occasion of the report’s launch, “Pune is flocked with students and techies from different parts of the country every year, the top 10 Most Trusted Brands of Pune clearly indicate the favoritism.” Also 2 City based brands Chitale Bandhu & Syska Led ranked as Category leaders in F&B – Diversified and Lighting respectively, he said. These revelations were a result of The Brand Trust Report, India Study – 2015, the fifth in its series, published by TRA (formerly known as Trust Research Advisory), a leading research organization dedicated to understanding and simplifying concepts related to Trust. This year’s study involved 13000 hours of fieldwork covering 2373 consumer-influencers across 16 cities in India and generated 5 million datapoints and 19,000 unique brands from which the top 1000 brands have been listed in this year’s report. The 190 page, hardbound report is available for Rs. 14000/-. Kolkata, India, 26th February, 2015 : India’s much anticipated and most rigorous brand evaluation, The Brand Trust Report, India Study, a comparison of the trust held in brands, has been released for 2015. Samsung Mobiles leads East as the Most Trusted Brand followed by Sony both brands have moved up one place from All-India rank. Nokia ranks 3rd in East, up two places from All-India rank. 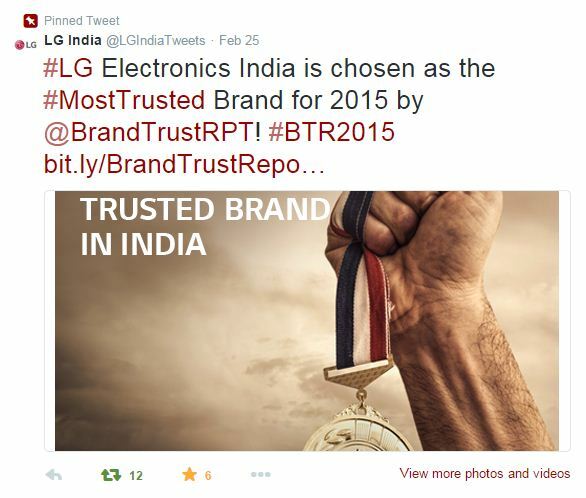 LG is East India’s 4th Most Trusted Brand, down three places from its All-India rank. Lakme secures East India’s 5th position improving its national rank by twenty places and Britannia is East India 6th Most Trusted Brand up twenty places from its All-India rank. Godrej at 7th in the East is up two places from its All-India position and Colgate at 8th position is up fourteen places, Dettol at 9th in East betters its All-India rank by eighteen slots and Amul at East India’s 10th is up two places as compared to All-India ranks. 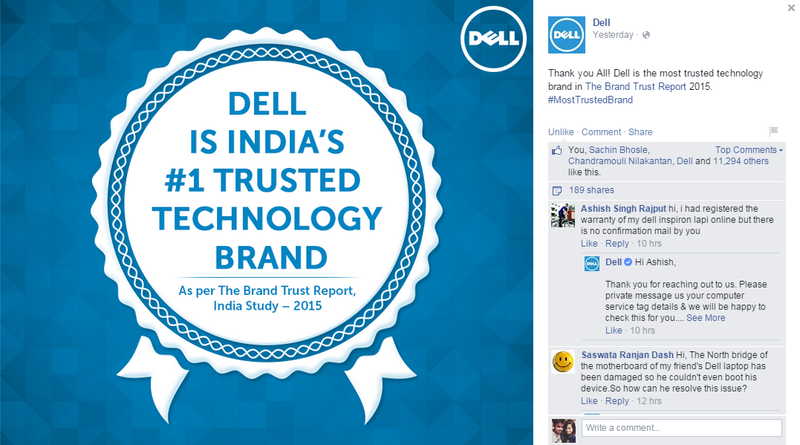 Last year the 5 Most Trusted East India brands were Samsung, Sony, Tata, Nokia and LG. The Brand Trust Report, the fifth in its series, is the result of a comprehensive primary research conducted on the proprietary 61-Attribute Trust Matrix of TRA (formerly known as Trust Research Advisory). This year’s study involved 13000 hours of fieldwork covering 2373 consumer-influencers across 16 cities in India and generated 5 million datapoints and 19,000 unique brands from which the top 1000 brands have been listed in this year’s report. The 190 page, hardbound report is available for Rs. 14000/-. The East zone cities include Kolkata and Guwahati covering nearly 17% of all the respondents. Chandramouli, CEO, TRA, said on the occasion of the report’s launch, “There has been an encouraging trend that we notice in this year’s Brand Trust Report 2015 as far as companies based out of West Bengal are concerned. A number of products like Keo Karpin Hair oil – a regular name in Bengali household from Dey’s Medical Company is a surprise direct entry and nationally positioned at 618th along with Century Plywood ranked at 336th and Anjali Jewellers at 556th.” Also a number of homegrown brands like ITC (All-India rank 34th), Boroline – another popular Bengali household name (All-India rank 81st), Emami (All-India rank 116th) Bisk Firm (All-India rank 276th ) are slowly gaining a strong foothold in the rest of Indian markets and have gained Trust as compared to Brand Trust Report 2014. The other significant brands from Eastern region who have been recognized for their ‘trust’ factor in the BTR 2015 include Turtle, Kutchina, Khadims, Linc Pens, Berger Paints , Keyaseth Spa, Dunlop(Tyre),Raja Biscuits, Rupa Frontline, he added. 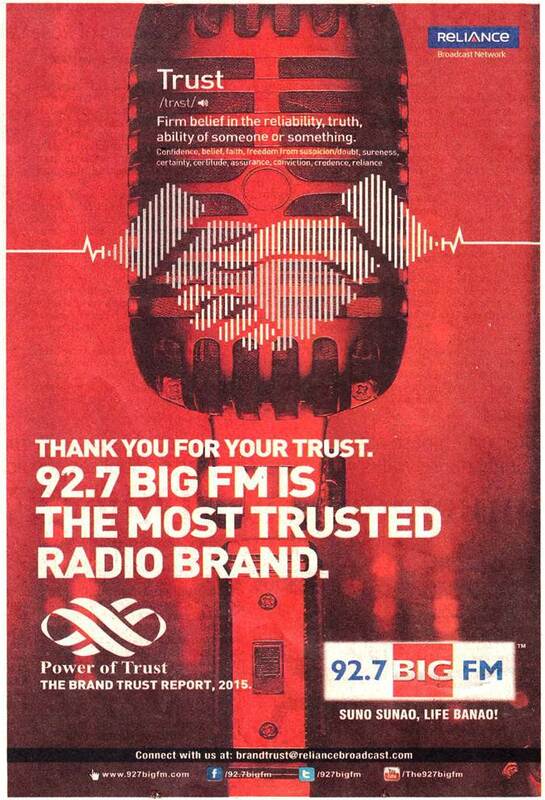 Across India, some of the important category leaders in Brand Trust are LIC (BFSI), IIT (Education), Hindustan Petroleum (Energy), Colgate (FMCG), Amul (F&B), Dabur (Healthcare), Amazon (Internet), Hawkins (Kitchenware), Asian Paints (Manufacturing), Bata (Personal Accessories), Amitabh Bachchan (Personalities), KFC (Retail), Airtel (Telecom) and Air India (Transportation). TRA, a Comniscient Group company, is an actionable insights and brand intelligence company dedicated to understanding and analyzing stakeholder behaviour through two globally acclaimed, proprietary matrices of Brand Trust and Brand Attractiveness. TRA was conceived in 2008 to decipher, analyze and measure Brand Trust, to make it universally understood and easily applied. TRA conducts primary research with consumers and other stakeholders to assist business decisions and give brands insights on solutions to consumer behaviour. TRA provides Competitive Intelligence Reports mined from its 11 million data-points on brand intangibles of 20,000 brands, and also undertakes custom-made studies for brands. TRA is the publisher of The Brand Trust Report, India’s Most Attractive Brands & India’s Most Trusted Educational Institutes. Chennai, India, 26th February 2015 : India’s much anticipated and most rigorous brand evaluation, The Brand Trust Report, India Study, a comparison of the trust held in brands, has been released for 2015. LG leads South as the Most Trusted Brand as well as All-India rank, followed by Sony which secures 2nd rank in South up from one place from All-India rank. Samsung mobiles ranks 3rd in South, down one place from its All-India rank. 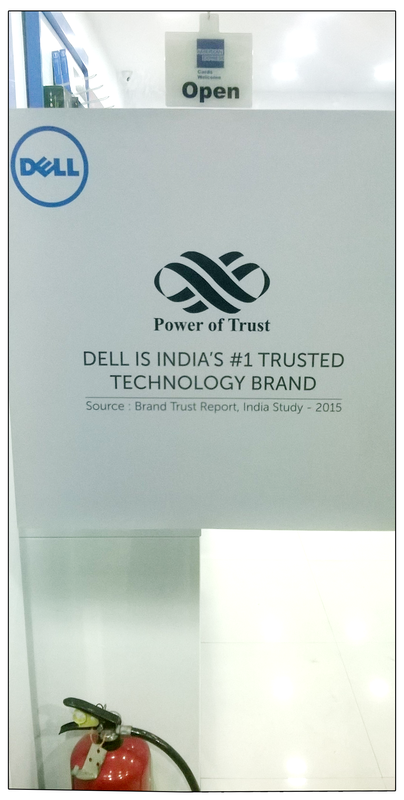 Dell is South India’s 4th Most Trusted brand, up four places and Hewlett Packard secures South India’s 5th position, up five places from All-India rank and Apple is at South India’s 6th position up seven places from its All-India rank. Bata is at 7th in the South is up four places and Bajaj at 8th position is down by two places from its All-India rank, Axe is the 9th Most Trusted Southern brand, improving its national ranks by nineteenth places and Nokia is at 10th in the South India down by five places as compared to All-India ranks. Last year the 5 Most Trusted South India brands Samsung, Sony, Nokia, Hero Motocorp and LG. The Brand Trust Report, the fifth in its series, is the result of a comprehensive primary research conducted on the proprietary 61-Attribute Trust Matrix of TRA (formerly known as Trust Research Advisory). This year’s study involved 13000 hours of fieldwork covering 2373 consumer-influencers across 16 cities in India and generated 5 million datapoints and 19,000 unique brands from which the top 1000 brands have been listed in this year’s report. The 190 page, hardbound report is available for Rs. 14000/-. The South zone cities include Chennai, Bangalore, Hyderabad, Cochin and Coimbatore covering nearly 26.17% of all the respondents. Chandramouli, CEO, TRA, said on the occasion of the report’s launch, “South India’s preferences have always been distinct and do not tow the All-India line. While a comparison of the top 50 in the zone shows small differences, these differences become stark as we study the entire group of 500 brands.” Also, Chennai has shown its unique preference with 15 brands namely Aachi Masala, Amazon, Aavin Milk, MTR, Mercedes Benz, Hamam, Santoor, Close up, Tata Docomo, TCS, Wipro, Fila, Vatika, Eva and Microsoft features in 100 Most Trusted of South India are not seen in the 100 Most Trusted of the other three zones, he also said.